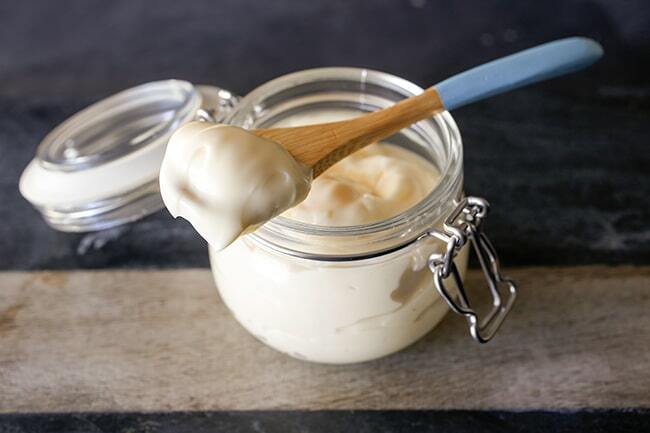 Mayo is my favourite condiment, and making your own mayonnaise from scratch makes it a super healthy, delicious dairy free addition to meals. Insert butterfly, add yolk, mustard, vinegar, honey, salt and pepper to mixer bowl. Mix for 1 min/37°C or 100°F/speed 4/MC on..
Set mixer to 3 mins/37°C or 100°F/speed 4 and VERY slowly start drizzling oil into bowl. Take the full 3 minutes to do so. Scrape bowl out and set aside in the fridge. I use the avocado oil from Costco. If you don't have a costco near you, I recommend you use Cobram extra light tasting olive oil as the avocado oil from supermarkets is pretty gross! To Store: 3-5 days in a sterilised jar in the fridge. Sooooo good!! Best mayo ever! 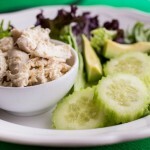 I use Moro Light Taste Olive Oil and it was great! But I’ll try Cobram brand next time! Agreeing with Philippa Kelly, would be great if you could also do a Magimix CE conversions. If you approach Magimix they might be happy to provide you with one to test with. Its a high quality thermo machine. This is an amazing mayonaise. I will definetly be making this all the time over summer. I added jalapeños (I have an unhealthy love for them) to mix with lettuce sandwiches. OMG it was sensational. This is really good! Usually I’m not keen on mayo’s made with avocado oil but I really like this. I’ll probably use less honey next time as it’s a touch sweeter than I’d like. This mayo is absolutely beautiful. It has such a lovely fresh taste. My only complaint is that is that the recipe doesn’t make a larger quantity cause it gets devoured pretty quickly in my house. This works perfectly every time! Absolutely scrumptious! We make it on a weekly basis- use ALDI mild olive oil or avocado oil if we have been to Costco. Can’t wait to try this, I only have to wait 6 months until I have my baby… would there be any substitute for egg that would still work??? Try aquafaba (chickpea liquid) as an egg substitute. maybe the egg yolk would be cooked enough at 37 degrees for 5 minutes? were converted into Magimix Cook Expert instructions instead of needing to spend time converting. If you have a magimix cook expert maybe you could convert the recipes and share the tips with the group? It’s hard to convert when you don’t own one. There’s are so many thermal cookers now it would be hard to keep up and convert the recipes as you could appreciate. Hi Philippa, you can do this in the small bowl in the food processor, the Magimix App and book have a similar recipe to this one and would be easily tweaked to these ingredients. Insert butterfly, add yolk, mustard, vinegar, honey, salt and pepper to mixer bowl. Mix for 1 min/37°C/speed 12/MC on..
Set mixer to 3 mins/37°C/speed 12 and VERY slowly start drizzling oil into bowl. Take the full 3 minutes to do so. Scrape bowl out and set aside in the fridge.